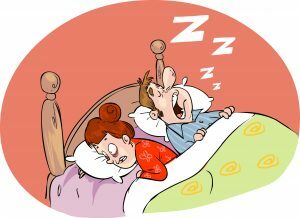 Snoring can be a sign of an underlining oral health issue that needs to be resolved. Though you may not be aware of it, it’s your partner or friends who have to deal with the noise every night. It’s disturbing and can even prevent your partner from enjoying a good night’s sleep. Sleep apnoea is a sleep disorder associated with inconsistent breathing when you are asleep. The inconsistent breathing is usually a result of a reduced airway in the throat, reducing air from getting in the lungs. Sleep apnoea results in interrupted sleep because the lack of enough air in your lungs triggers the brain to wake you. It is common for some people to constantly feel tired, and suffer from other conditions as a result of sleep apnoea. Sleep apnoea has been linked to road accidents, low cognitive abilities, poor performance at school and work, and mood disturbance. These signs may not be noticed by someone experiencing them, but rather a sleep partner. Your dentist can recommend wearing a mandibular advancement device splint (MAS) which is a device that is placed on your teeth to push the tongue and jaw forward expanding the space in your throat to increase airflow. More space allows your lungs to receive enough oxygen which is then transported to the brain, aiding in a restful night’s sleep. Although more research is still going on for sleep apnoea, when left untreated it can cause high blood pressure, irregular heartbeat, stroke, heart attack or type 2 diabetes. Changing your lifestyle like eating healthy foods, moderating drinking and smoking habits, avoiding sleeping pills and exercising could also prevent developing sleep apnoea. Have you ever spent a night with someone who was clenching and grinding their teeth or you have been told that you gnash your teeth when asleep? Well, that is what is referred to as bruxism. Bruxism can cause wear and tear on your enamel which can lead to breakage of a tooth, pain on jaws and muscles problems. Most children experience this condition in their childhood but when they carry it to their adulthood it can start having these adverse effects. A simple check up with your dentist can help with alleviating bruxism. A thorough examination will be carried out to determine the extent of the damage to the muscles, jaws, and enamel. Improper tooth alignment and effects of previous dental work could be the cause of bruxism – both treatable by a qualified dentist. Other factors such as stress, poor sleep, high caffeine and nicotine intake have also been identified to cause bruxism. Sleep apnoea has also been linked to bruxism and treating sleep apnoea can help minimize bruxism. Currently, there are no treatments that will stop bruxism, but a mouth guard designed by your dentist can be used to protect enamel, jaw joints, and muscles when you involuntary gnash and grind your teeth.